Come Back to Rockville! brings social practice to VisArts and the extended Rockville community. Artists Naoko Wowsugi and Graham Coreil-Allen were commissioned to create original projects investigating and initiating social networks, invisible communities and hidden public places. Curated by Laura Roulet (2015 VisArts Mentoring Curator). Naoko Wowsugi, a Korean woman born and raised in Japan, explores the complexity of personal identity through her portrait projects. 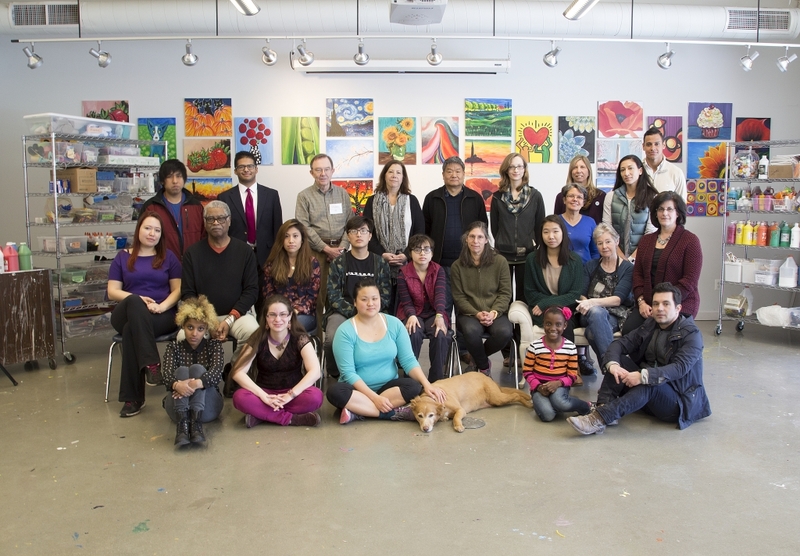 “Group Portrait Journey in Rockville, Maryland” originates with the VisArts group: a portrait of people who work for and support this art center. The group of Board members, staff, educators, and volunteers is a microcosm of community diversity. From this template, Wowsugi spins a web of connections outward by following individuals to other groups they may belong to, and photographing these secondary connections. As the “journey” continues, the artist, photographic subjects and viewers are presented with an interwoven, revelatory composition of their community as a whole. Inspired by German photographer August Sander (1876-1964) with his systematic documentation of the people of his time, Wowsugi creates a contemporary social typology. Baltimore-based artist Graham Coreil-Allen brings his New Public Sites project to VisArts with “The Ragged Edge of Rockville,” a radical mapping of “some of the invisible sites, overlooked features and literary spirits embedded in downtown Rockville.” Incorporating walking tours, interactive maps and a partially crowd-sourced exhibition, Coreil-Allen reveals Rockville’s historic foundations as they have become complicated by new suburbanism. The title is inspired by a quote from F. Scott Fitzgerald’s best-known novel, The Great Gatsby, in which the protagonist recalls how his birthplace in the “Middle West seems like the ragged edge of the universe now.” The nearby gravesites of F. Scott Fitzgerald and his wife Zelda are among the touchstones of this project.